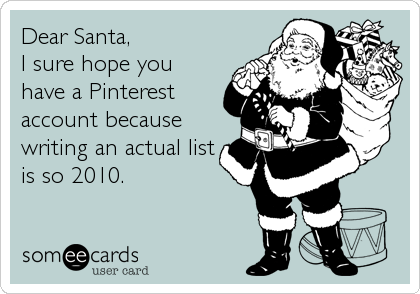 I Love You More Than Carrots: Dear Santa, I Hope You Have A Pinterest Account. Did you know you can create your own ecards? I did not. Clearly this means I've been living under a rock (or attempting to mother two children two and under without turning into a raging alcoholic). Same difference. Anyways not only did I just show my true age but I'm sure I've given you all a good laugh at my naivety. I had no idea either! Fun! LOL can we be best friends?! I will becoem a raging alcoholic with you! And I did not know really that you could create you own...though I guess that makes sense! I'm right there with ya girl. I had no idea.